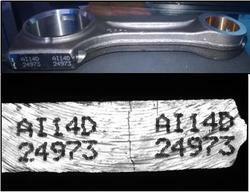 We are a leading Manufacturer of character scanning on connecting rod from Ahmedabad, India. We, ACRIFAB PRIVATE LIMITED are Vision Inspection Machine Manufacturer and Machine Vision Integrator. We Provide Customized Solution as per Customer’s Requirement. We installed Vision system on Client’s Existing Line and also provide Auto Sorting High Speed Vision Inspection Machine. Here entire above image with software tools checks product data and then software will announce result. If any character mismatches occurs vision inspection system will stop machine.